Bachir Mustapha Sayed, brother of the founder member of the Polisario Front, El-Ouali Mustapha Sayed, murdered in the 70s in Mauritania, has been reportedly caught by Polisario militiamen, with the support of the Algerian army, while he was attempting to return to Morocco. 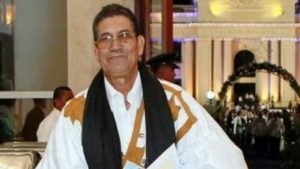 Mustapha Sayed, who has been reported missing on July 20 after he gave no sign of life for three days, was found lost in the desert near the Algerian border and was escorted back, manu-militari, to the Tindouf camps, the Speaker of the so-called “Sahrawi parliament,” Khatri Addouh, told a Polisario radio last Saturday. Addouh gave no explanation on the circumstances of the Polisario official’s disappearance. Bachir Mustapha Sayed, who was accompanied by one of his sons, escaped the surveillance of the Polisario militia and the Algerian army stationed around the Tindouf camps and was reported missing. A general alert was immediately launched at the Polisario HQ in Rabouni out of fear that Sayed succeeds to flee to Morocco, the source explained. According to our informant contacted by telephone, it’s a family member who signaled Bachir’s absence, fearing that he suffers the same fate as his brother El Ouali. El Ouali was assassinated during an operation conducted by a commando of Algerian army officers and Polisario armed militiamen in the Mauritanian territory on 9 June 1976. The source in Tindouf explained that Bachir Mustapha Sayed’s attempt to go to Morocco was probably motivated by the fact that Algerian rulers prevented him from succeeding to Mohamed Abdelaziz at the helm of the “SADR” and gave the position to their man, Brahim Ghali. For Bachir Mustapha Sayed, his return to Morocco is just a matter of time, the source said, adding that he is now in danger in the Tindouf camps and may be liquidated at any time as his brother who was killed because he dared to stand up to the Algerian leaders and propose a negotiated settlement with Morocco to the Sahara issue.